The New York Giants are still feeling the sting of losing to the division rival Philadelphia Eagles last week in the closing seconds, but they will have an opportunity to get back on track this weekend against the banged up Green Bay Packers. 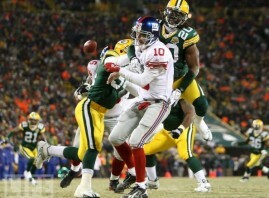 Unfortunately, the Packers are in desperation mode right now and will be looking to dominate the Giants with their lockdown defense. That means trouble for Eli Manning and Clay Matthews will have him in his crosshairs all game long. The Chicago Bears are the first team in the NFL this season to win a division title (NFC North), but they will have their work cut out for them this weekend when they host the New York Jets. Even though the Bears are already playoff bound, the Jets will be out for blood as they are trying to make it into the postseason. With that being said, I don’t think any offensive player on the Bears will be having a good day this weekend, especially running back Matt Forte. The San Diego Chargers have been able to get back on track after losing to the division rival Oakland Raiders a few weeks ago, but the one player that has suffered from the return of the Pro Bowl wide receiver Vincent Jackson (three touchdowns last week) is up and comer Malcolm Floyd. Even though Floyd has played really well in place of Jackson throughout this season and might even warrant a Pro Bowl selection, he has been battling injuries and will have to take a backseat to Jackson from here on out. The Baltimore Ravens are on the verge of clinching a playoff spot as they will head into Cleveland to take on the Browns, but I wouldn’t be counting on tight end Todd Heap putting up big numbers as he is suffering from an injury that might even keep him out of the game. The Atlanta Falcons have already clinched a playoff spot in the NFC Conference, but the NFC South is up for grabs and will be on the line against the defending Super Bowl champion New Orleans Saints on Monday Night Football. With the Falcons defense going up against the Saints potent offense, I would advise you to sit Atlanta D as Drew Brees and company will almost certainly light up the scoreboard.